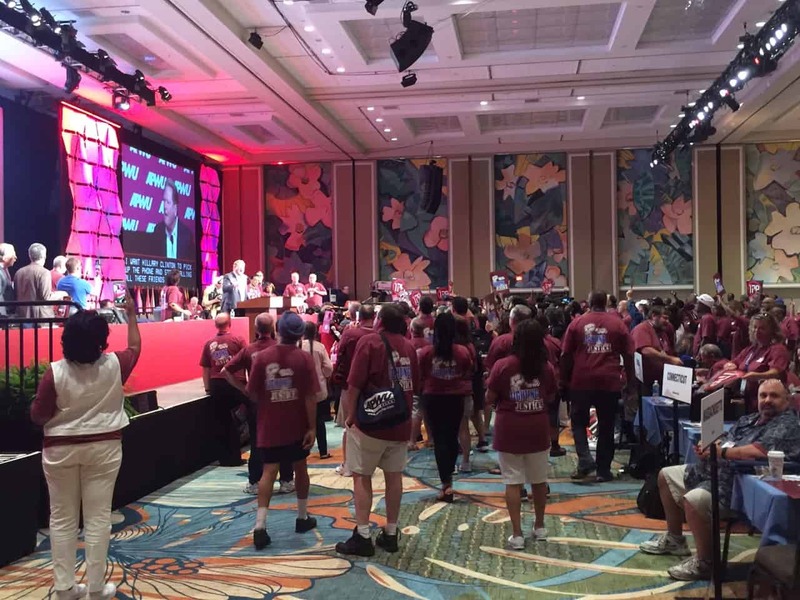 The American Postal Workers Union adjourned its biennial convention early so that union delegates, joined by family members, could participate in the spirited rally, complete with signs, marching and a labor chorus that sang songs with a “no TPP” refrain. 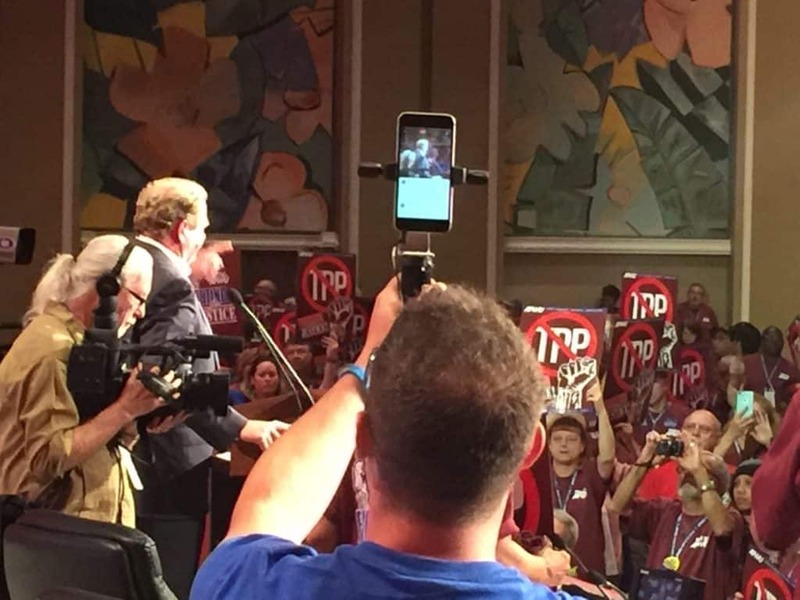 The APWU-sponsored event was solely devoted to the trade deal and was well-attended by Florida political reporters who wanted to hear Senate candidate Rep. Alan Grayson’s address to the crowd. Grayson an ardent opponent of TPP faces off in the Florida Democratic Primary next week against another Florida Congressman, Patrick Murphy, who is on record opposing the trade pact. Whoever wins the primary will challenge Sen. Marco Rubio who was for TPP until he more recently expressed lukewarm reservations against the trade deal. Broadcaster Ed Schultz followed Grayson to the podium. Schultz, formerly with MSNBC and now with RT, drew comparisons with the Postal Enhancement and Accountability Act. The PEAA was passed at the 11th hour in a lame duck session of Congress in 2006. The legislation has since hobbled the United States Postal Service for nearly a decade with heavy debt as a result of a burdensome requirement that USPS must prefund employee retirement healthcare benefits 75 years into the future. The postal service actually pays for retirees not yet born as a result of the legislation. USPS is the only entity, public or private, with such a requirement. The deep wounds caused by PEAA have made U.S. postal workers and their unions wary of anything that may come up in a lame duck session of Congress when TPP would likely come up for a vote. Postal workers in the United States and other Pacific-rim nations such as Canada and Japan also have voiced suspicions after reviewing legal analysis prepared in this country and elsewhere of TPP and how it might affect public sector services currently offered and hurt the ability to launch new offerings such as postal banking. The Office of the U.S. Trade Representative pushed back against APWU and The Grand Alliance to Save the Post Office, telling Politico, “No provision in TPP prevents postal entities from selling insurance or offering banking services,” USTR spokesman Matt McAlvanah said.